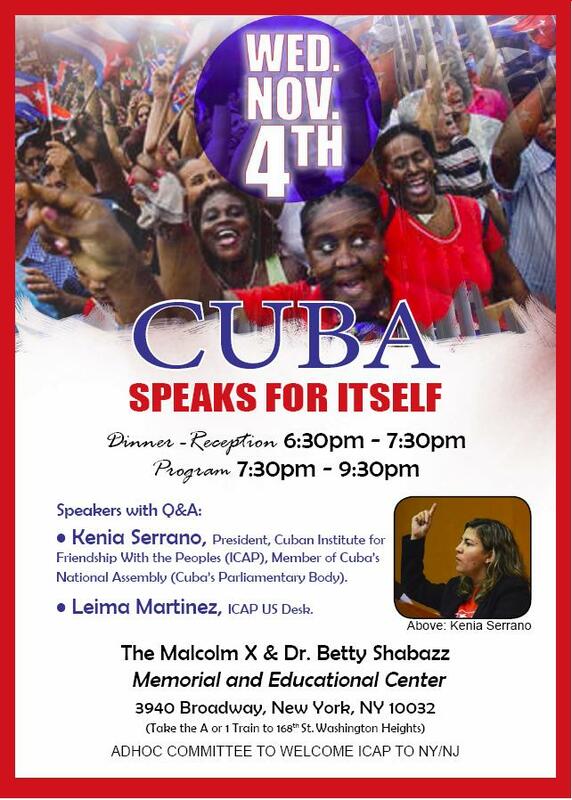 Kenia Serrano and Leima Martinez from ICAP to Speak in DC, NY/NJ and Northern California. From November 3-17 a high level delegation from the Cuban Institute of Friendship with the Peoples (ICAP) will travel to New York, Washington DC, and the San Francisco Bay Area to build bridges of solidarity between the people of Cuba and the United States. The delegation includes Kenia Serrano Puig, President of ICAP and Leima Martinez, from the North America Division of ICAP. 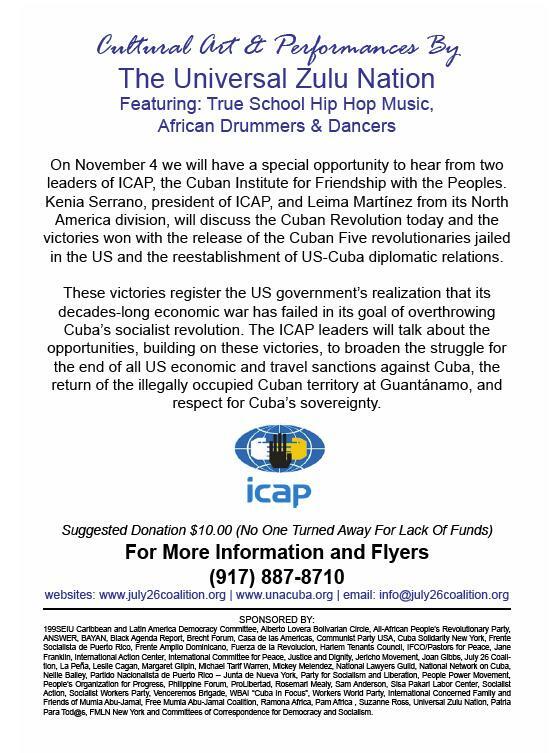 Founded 1n December 30, 1960, ICAP is a social organization for the purpose of promoting international solidarity with Cuba. 9:30-11:30AM – Encounter with students at John Jay College with Father Luis Barrios. This event is open to the public. 4:00-6:00PM – Meeting with young activists at the former site of the Hotel Teresa. RSVP here. 6:30-9:30PM – Public solidarity event at the Malcolm X and Dr. Betty Shabazz Center. Email here more information. 10:00-11:30AM – Encounter with students at Essex County Community College in New Jersey. The event is open to the public. 8:30AM – National Network on Cuba Fall meeting. For more information call 617-733-4478. 9:30AM – National Network on Cuba Fall meeting. For more information call 617-733-4478. 6:30PM – An Evening of Solidarity with the Cuban People. 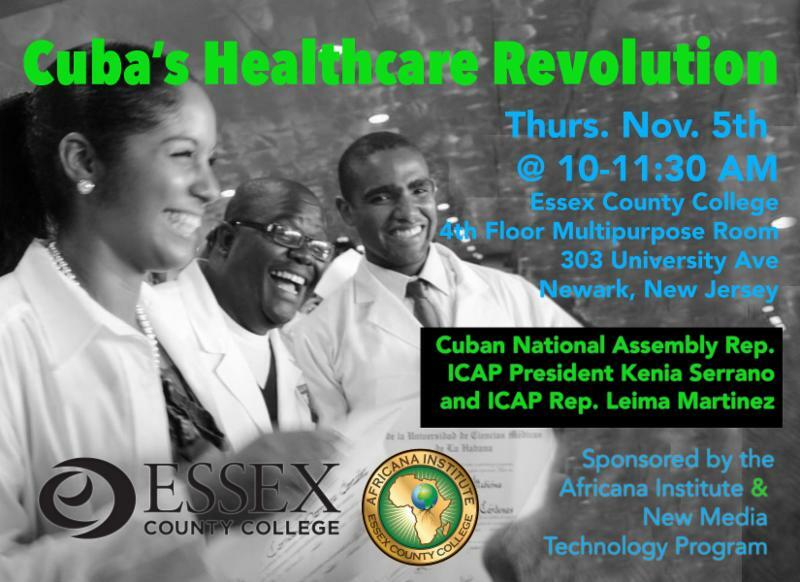 Featuring Kenia Serrano Puig, President of (ICAP) and Member of the Cuban National Parliament. Free admission for students and children. $10-20 Donation at the Door. Nobody is turned away for lack of funds.